Set far in the future, Outcasts is a new sci-fi-esque BBC One eight parter, about a group of refugees from Earth working hard to establish a new community on a new planet. But fortunately for the future of the human race, it's comforting to know that despite all the sadness and death and that, we will still have access to the latest autumn collection from Gap. All of the cast look like they've just had a trolley dash around its big store at Oxford Circus, which is comforting when you're fighting for the very survival of our species. I'm not sure if Outcasts is meant to be realistic, but everyone seems terribly serious - so I guess it is, as far as anything set a long time in the future on another planet can be. It's just that no-one seems to stop for lunch and a fag, and no-one seems to like watching Miranda. "Sweepin' - and admittedly stunning - vistas"
What with its sweepin' - and admittedly stunning - vistas, coupled with dimly lit rooms and plenty of whispered dialogue, Outcasts has "epic" written all over it. Match that with a competent cast of well known and semi-well known actors all vying for the best lines, many of which are delivered with hands on hips as they stand around on craggy mountains or stomping across deserts, and you should have a hit on your hands. 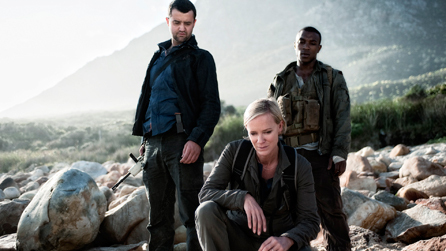 Hermione Norris plays a similar character to the one she played in Spooks, as far as I can tell, while other recognisable faces from other programmes off the telly, all help sell the message of "big budget", "we want international sales", and "look at our production values", all at once. The programme, now half way through its run of eight, is described in the press release as "a group of courageous pioneers facing a unique opportunity", but it's probably more accurate to say "a group of courageous actors facing a unique opportunity". It looks great, and it's even quite spectacular, but so far, I'm not just caring that much about what happens. But then perhaps I shouldn't watch it while I'm doing my ironing. Either way, let's hope it gets a second series.